Medical Thermographyor DITI, is a simple test of physiology, showing us how the body is functioning,and, like ultrasound and mammography, it can help to identify risk factors which may not be determined in any other way. Breast Thermographyoffers a valuable breast health assessment, which can help you and your practitioner identify early changes and can warn us of the development of breast disease at the earliest possible time. Thermography focusses on preventionand finding the root causeof pain and disease processes by visualising inflammation, circulation and nerve damage. Thermography is useful for those women who seek a non-invasiveand non-radiationoption to regular breast screening or as an addition to other screening tests, like ultrasound and mammography. Medical Thermography monitors your breast health by looking for any irregular or abnormal blood flow(neovascularity) in the breasts, chest and back and can show us any thermal changes between each screening.An abnormal blood flow in one particular area could indicate the development of malignancy, because a tumour needs a blood supply to feed it. This process is usually visible earlier (up to 8 years) with thermal imaging compared to when a mammogram can “see” a tumour. Mammography visualises the end of a disease processand can show tumours only when they are well established. Besides looking for this unusual blood supply, we can monitor general changes, which could be an indication of fibrocystic activity, hormone activityor inflammatory processes, like inflammatory breast cancer, a type of cancer that does not show up on a mammogram, because there are no lumps. Thermography is equally accurate in all age groups:dense breast tissue (mainly of younger women but not exclusively) is not relevant to the accuracy rate of thermography compared to mammography, since we do not need to look deep inside the breasts to make an assessment of health. Mammography however is significantly less accurate in this younger age group due to breast density. Prevention:early detection is still the most important factor in the outcome of breast disease. DITI is excellent at seeing thermal changes early, up to 8 years before mammography. Radiation-free:DITI is 100% safe to use for both patient and practitioner. Non-invasive:you don’t need to be touched or squashed. A larger area can be seen, including the thyroid and lymph glands in the armpits, often involved in breast disease. Monitoring treatment and recovery: DITI can help you monitor the healing process after surgery, chemo- or radiation therapy. Breast density plays no role: any woman of any age can be screened with the same accuracy. Screening can start at age 18. Thermography is reliable due to its state-of-the-art imaging technology. The appointmenttakes about 1 hour, of which approx. 10 minutes is for the actual screening. 15 Minutes is needed for you to acclamatise to the room temperature and be aware that you need to be partly undressed. In this hour we have plenty of time to talk about any other health issues, which may be relevant to the screening. The initial breast screening consist of 2 screenings:one and then a follow up after 3 to 6 months, to establish your personal baseline.Each woman’s breasts have a different thermal fingerprint so to speak and to make an accurate assessment we need to see which thermal patterns are normal for you by comparing initially the 2 screening results. Tumour cells double every 80 days and screening again after this period of time gives us a good impression of any changes. It enables us to rule out neovascularity. Once we have your baseline, you will be advised to come back on a yearly basis, especially recommended for younger women and women going through the menopause, since hormones are continuously changing. Thermography, as with any other screening method, is only valuable when tests are done at regular intervals to compare the screenings; therefore yearly thermal checks are advisable to build an accurate history of how your breasts are functioning. 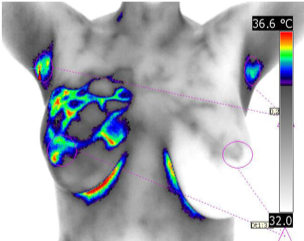 A positive thermogram is a strong indicator for a higher risk of developing breast disease in the future. Thermography is not only valuable in the early detection of breast disease, it can also bring to light unidentified sources of painin the body, which may be due to varicose veins, ligament damage, nerve entrapment, inflammation of tissues or organs, circulatory diseases, digestive issues or immune disease, just to name a few. Diabetic ulcers: thermography can help identify changes in the blood supply in the feet related to the formation of ulcers due to Diabetes, before they have come to the surface and can cause major problems. Preventative action can then be taken with a low carb dietand appropriate foot careto reduce the risk of further development and reverse symptoms. Medical Thermography can help your health practitioner make a positive diagnosis for Fibromyalgia and ME.Both Fibromyalgia and chronic fatigue have many changing symptoms making it hard to know for sure what is going on, but DITI can help your doctor “see” the inflammation patterns in your body and will be able to help you in the best way possible. The Appointmentfor a half and full body screening takes 1 ½ hour. The images can be viewed in real time on the laptop and you will have an opportunity to ask any questions you may have regarding your screening. Note that being the technician, I am not allowed to interpret your images. Interpretation is performed by a medically trained professional qualified in thermology. The full medical report is returned to you by email usually within 2 weeks. Cervical screening and uterine checks:a smear test and an ultrsound check are far better tests and are much more accurate in this case. Prostate health checks:a physical investigation, ultrasound and PSA test are the best for identifying abnormalities of the prostate in men. Screenings available by appointment only between 10 – 5 PM. Late afternoon / early evenings / Saturday mornings my be possible too depending on clinic.